Late on a Thursday evening in February 2017, Japanese Prime Minister Shinzo Abe’s plane landed at Andrews Air Force Base in Maryland for his first visit with President Donald Trump. A few hours earlier, the casino magnate Sheldon Adelson’s Boeing 737, which is so large it can seat 149 people, touched down at Reagan National Airport after a flight from Las Vegas. Adelson dined that night at the White House with Trump, Jared Kushner and Secretary of State Rex Tillerson. Adelson and his wife, Miriam, were among Trump’s biggest benefactors, writing checks for $20 million in the campaign and pitching in an additional $5 million for the inaugural festivities. Adelson was in town to see the Japanese prime minister about a much greater sum of money. Japan, after years of acrimonious public debate, has legalized casinos. For more than a decade, Adelson and his company, Las Vegas Sands, have sought to build a multibillion-dollar casino resort there. He has called expanding to the country, one of the world’s last major untapped markets, the “holy grail.” Nearly every major casino company in the world is competing to secure one of a limited number of licenses to enter a market worth up to $25 billion per year. “This opportunity won’t come along again, potentially ever,” said Kahlil Philander, an academic who studies the industry. The morning after his White House dinner, Adelson attended a breakfast in Washington with Abe and a small group of American CEOs, including two others from the casino industry. Adelson and the other executives raised the casino issue with Abe, according to an attendee. Adelson had a potent ally in his quest: the new president of the United States. Following the business breakfast, Abe had a meeting with Trump before boarding Air Force One for a weekend at Mar-a-Lago. The two heads of state dined with Patriots owner Bob Kraft and golfed at Trump National Jupiter Golf Club with the South African golfer Ernie Els. During a meeting at Mar-a-Lago that weekend, Trump raised Adelson’s casino bid to Abe, according to two people briefed on the meeting. The Japanese side was surprised. “It was totally brought up out of the blue,” according to one of the people briefed on the exchange. “They were a little incredulous that he would be so brazen.” After Trump told Abe he should strongly consider Las Vegas Sands for a license, “Abe didn’t really respond, and said thank you for the information,” this person said. Trump also mentioned at least one other casino operator. Accounts differ on whether it was MGM or Wynn Resorts, then run by Trump donor and then-Republican National Committee finance chairman Steve Wynn. The Japanese newspaper Nikkei reported the president also mentioned MGM and Abe instructed an aide who was present to jot down the names of both companies. Questioned about the meeting, Abe said in remarks before the Japanese legislature in July that Trump had not passed on requests from casino companies but did not deny that the topic had come up. Adelson has told his shareholders to expect good news. On a recent earnings call, Adelson cited unnamed insiders as saying Sands’ efforts to win a place in the Japanese market will pay off. “The estimates by people who know, say they know, whom we believe they know, say that we're in the No. 1 pole position,” he said. After decades as a major Republican donor, Adelson is known as an ideological figure, motivated by his desire to influence U.S. policy to help Israel. “I’m a one-issue person. That issue is Israel,” he said last year. On that issue — Israel — Trump has delivered. The administration has slashed funding for aid to Palestinian refugees and scrapped the Iran nuclear deal. Attending the recent opening of the U.S. embassy in Jerusalem, Adelson seemed to almost weep with joy, according to an attendee. But his reputation as an Israel advocate has obscured a through-line in his career: He has used his political access to push his financial self-interest. Not only has Trump touted Sands’ interests in Japan, but his administration also installed an executive from the casino industry in a top position in the U.S. embassy in Tokyo. Adelson’s influence reverberates through this administration. Cabinet-level officials jump when he calls. One who displeased him was replaced. He has helped a friend’s company get a research deal with the Environmental Protection Agency. And Adelson has already received a windfall from Trump’s new tax law, which particularly favored companies like Las Vegas Sands. The company estimated the benefit of the law at $1.2 billion. Adelson’s influence is not absolute: His company’s casinos in Macau are vulnerable in Trump’s trade war with China, which controls the former Portuguese colony near Hong Kong. If the Chinese government chose to retaliate by targeting Macau, where Sands has several large properties, it could hurt Adelson’s bottom line. So far, there’s no evidence that has happened. With a fortune estimated at $35 billion, Adelson is the 21st-richest person in the world, according to Forbes. In August, when he celebrated his 85th birthday in Las Vegas, the party stretched over four days. Adelson covered guests’ expenses. A 92-year-old Tony Bennett and the Israeli winner of Eurovision performed for the festivities. He is slowing down physically; stricken by neuropathy, he uses a motorized scooter to get around and often stands up with the help of a bodyguard. He fell and broke three ribs while on a ferry from Macau to Hong Kong last November. Yet Adelson has spent the Trump era hustling to expand his gambling empire. With Trump occupying the White House, Adelson has found the greatest political ally he’s ever had. Adelson grew up poor in Boston, the son of a cabdriver with a sixth-grade education. According to his wife, Adelson was beaten up as a kid for being Jewish. A serial entrepreneur who has started or acquired more than 50 different businesses, he had already made and lost his first fortune by the late 1960s, when he was in his mid-30s. It took him until the mid-1990s to become extraordinarily rich. In 1995, he sold the pioneering computer trade show Comdex to the Japanese conglomerate SoftBank for $800 million. He entered the gambling business in earnest when his Venetian casino resort opened in 1999 in Las Vegas. With its gondola rides on faux canals, it was inspired by his honeymoon to Venice with Miriam, who is 12 years younger than Adelson. It’s been said that Trump is a poor person’s idea of a rich person. Adelson could be thought of as Trump’s idea of a rich person. A family friend recalls Sheldon and Miriam’s two sons, who are now in college, getting picked up from school in stretch Hummer limousines and his home being so large it was stocked with Segway transporters to get around. A Las Vegas TV station found a few years ago that, amid a drought, Adelson’s palatial home a short drive from the Vegas Strip had used nearly 8 million gallons of water in a year, enough for 55 average homes. Adelson will rattle off his precise wealth based on the fluctuation of Las Vegas Sands’ share price, said his friend the New York investor Michael Steinhardt. “He’s very sensitive to his net worth,” Steinhardt said. By the early 2000s, Adelson’s Las Vegas Sands had surpassed Trump’s casino operations. While Trump was getting bogged down in Atlantic City, Adelson’s properties thrived. When Macau opened up a local gambling monopoly, Adelson bested a crowded field that included Trump to win a license. Today, Macau accounts for more than half of Las Vegas Sands’ roughly $13 billion in annual revenue. While their business trajectories diverged, Adelson and Trump have long shared a willingness to sue critics, enemies and business associates. Multiple people said they were too afraid of lawsuits to speak on the record for this story. In 1989, after the Nevada Gaming Control Board conducted a background investigation of Adelson, it found he had already been personally involved in around 100 civil lawsuits, according to the book “License to Steal,” a history of the agency. That included matters as small as a $600 contractual dispute with a Boston hospital. The lawsuits have continued even as Adelson became so rich the amounts of money at stake hardly mattered. In one case, Adelson was unhappy with the quality of construction on one of his beachfront Malibu, California, properties and pursued a legal dispute with the contractor for more than seven years, going through a lengthy series of appeals and cases in different courts. Adelson sued a Wall Street Journal reporter for libel over a single phrase — a description of him as “foul-mouthed” — and fought the case for four years before it was settled, with the story unchanged. In a particularly bitter case in Massachusetts Superior Court in the 1990s, his sons from his first marriage accused him of cheating them out of money. Adelson prevailed. Adelson rarely speaks to the media any more, with occasional exceptions for friendly business journalists or on stage at conferences, usually interviewed by people to whom he has given a great deal of money. “He keeps a very tight inner circle,” said a casino industry executive who has known Adelson for decades. Adelson declined to comment for this story. Adelson once told a reporter of entering the casino business late in life, “I loved being an outsider.” For nearly a decade he played that role in presidential politics, bankrolling the opposition to the Obama administration. As with some of his early entrepreneurial forays, he dumped money for little return, his political picks going bust. In 2008, he backed Rudy Giuliani. As America’s Mayor faded, he came on board late with the John McCain campaign. In 2012, he almost single-handedly funded Newt Gingrich’s candidacy. Gingrich spent a few weeks atop the polls before his candidacy collapsed. Adelson became a late adopter of Mitt Romney. Despite Trump’s barbs, Adelson had grown curious about the candidate and called his friend Steinhardt, who founded the Birthright program that sends young Jews on free trips to Israel. Adelson is now the program’s largest funder. Miriam Adelson, a physician born and raised in what became Israel, is said to be an equal partner in Sheldon Adelson’s political decisions. He has said the interests of the Jewish state are at the center of his worldview, and his views align with Prime Minister Benjamin Netanyahu’s right-of-center approach to Iran and Israel’s occupation of Palestinian territories. Adelson suggested in 2014 that Israel doesn’t need to be a democracy. “I think God didn’t say anything about democracy,” Adelson said. “He didn’t talk about Israel remaining as a democratic state.” On a trip to the country several years ago, on the eve of his young son’s bar mitzvah, Adelson said, “Hopefully he’ll come back; his hobby is shooting. He’ll come back and be a sniper for the IDF,” referring to the Israel Defense Forces. In December 2016, Adelson donated $5 million to the Trump inaugural festivities. The Adelsons had better seats at Trump’s inauguration than many Cabinet secretaries. The whole family, including their two college-age sons, came to Washington for the celebration. One of his sons posted a picture on Instagram of the event with the hashtag #HuckFillary. The investment paid off in access and in financial returns. Adelson has met with Trump or visited the White House at least six times since Trump’s election victory. The two speak regularly. Adelson has also had access to others in the White House. He met privately with Vice President Mike Pence before Pence gave a speech at Adelson’s Venetian resort in Las Vegas last year. “He just calls the president all the time. Donald Trump takes Sheldon Adelson’s calls,” said Alan Dershowitz, who has done legal work for Adelson and advised Trump. Adelson’s tens of millions in donations to Trump have already been paid back many times over by the new tax law. While all corporations benefited from the lower tax rate in the new law, many incurred an extra bill in the transition because profits overseas were hit with a one-time tax. But not Sands. Adelson’s company hired lobbyists to press Trump’s Treasury Department and Congress on provisions that would help companies like Sands that paid high taxes abroad, according to public filings and tax experts. The lobbying effort appears to have worked. After Trump signed the tax overhaul into law in December, Las Vegas Sands recorded a benefit from the new law the company estimated at $1.2 billion. In 2014, Adelson told an interviewer he was not interested in building a dynasty. “I want my legacy to be that I helped out humankind,” he said, underscoring his family’s considerable donations to medical research. But he gives no indication of sticking to a quiet life of philanthropy. In the last four years, he has used the Sands’ fleet of private jets, assiduously meeting with world leaders and seeking to build new casinos in Japan, Korea and Brazil. He is closest in Japan. Japan has been considering lifting its ban on casinos for years, in spite of majority opposition in polls from a public that is wary of the social problems that might result. A huge de facto gambling industry of the pinball-like game pachinko has long existed in the country, historically associated with organized crime and seedy parlors filled with cigarette-smoking men. Opposition to allowing casinos is so heated that a brawl broke out in the Japanese legislature this summer. But lawmakers have moved forward on legalizing casinos and crafted regulations that hew to Adelson’s wishes. “Japan is considered the next big market. Sheldon looks at it that way,” said a former Sands official. Adelson envisions building a $10 billion “integrated resort,” which in industry parlance refers to a large complex featuring a casino with hotels, entertainment venues, restaurants and shopping malls. The new Japanese law allows for just three licenses to build casinos in cities around the country, effectively granting valuable local monopolies. At least 13 companies, including giants like MGM and Genting, are vying for a license. Even though Sands is already a strong contender because of its size and its successful resort in Singapore, some observers in Japan believe Adelson’s relationship with Trump has helped move Las Vegas Sands closer to the multibillion-dollar prize. In another sign of Adelson’s direct access to the incoming president and ties with Japan, he secured a coveted Trump Tower meeting a few weeks later for an old friend, the Japanese billionaire businessman Masayoshi Son. Son’s company, SoftBank, had bought Adelson’s computer trade show business in the 1990s. A few years ago, Adelson named Son as a potential partner in his casino resort plans in Japan. Son’s SoftBank, for its part, owns Sprint, which has long wanted to merge with T-Mobile but needs a green light from the Trump administration. A beaming Son emerged from the meeting in the lobby of Trump Tower with the president-elect and promised $50 billion in investments in the U.S. When Trump won the election in November 2016, the casino bill had been stalled in the Japanese Diet. One month after the Trump-Abe meeting, in an unexpected move in mid-December, Abe’s ruling coalition pushed through landmark legislation authorizing casinos, with specific regulations to be ironed out later. There was minimal debate on the controversial bill, and it passed at the very end of an extraordinary session of the legislature. “That was a surprise to a lot of stakeholders,” said one former Sands executive who still works in the industry. Some observers suspect the timing was not a coincidence. “After Trump won the election in 2016, the Abe government’s efforts to pass the casino bill shifted into high gear,” said Yoichi Torihata, a professor at Shizuoka University and opponent of the casino law. On a Las Vegas Sands earnings call a few days after Trump’s inauguration, Adelson touted that Abe had visited the company’s casino resort complex in Singapore. “He was very impressed with it,” Adelson said. Days later, Adelson attended the February breakfast with Abe in Washington, after which the prime minister went on to Mar-a-Lago, where the president raised Las Vegas Sands. A week after that, Adelson flew to Japan and met with the secretary general of Abe’s Liberal Democratic Party in Tokyo. The casino business is one of the most regulated industries in the world, and Adelson has always sought political allies. To enter the business in 1989, he hired the former governor of Nevada to represent him before the state’s gaming commission. In 2001, according to court testimony reported in the New Yorker, Adelson intervened with then-House Majority Whip Rep. Tom DeLay, to whom he was a major donor, at the behest of a Chinese official over a proposed House resolution that was critical of the country’s human rights record. At the time, Las Vegas Sands was seeking entry into the Macau market. The resolution died, which Adelson attributed to factors other than his intervention, according to the magazine. Adelson appears emboldened. When he was in Osaka last fall, he publicly criticized a proposal under consideration to cap the total amount of floor space devoted to casinos in the resorts that have been legalized. In July, the Japanese Diet passed a bill with more details on what casinos will look like and laying out the bidding process. The absolute limit on casino floor area had been dropped from the legislation. Japanese opposition politicians have seized on the Adelson-Trump-Abe nexus. One, Tetsuya Shiokawa, said this year that he believes Trump has been the unseen force behind why Abe’s party has “tailor-made the [casino] bill to suit foreign investors like Adelson.” In the next stage of the process, casino companies will complete their bids with Japanese localities. Adelson said he was convinced to support the attack on McMaster after Adelson spoke with Safra Catz, the Israeli-born CEO of Oracle, who “enlightened me quite a bit” about McMaster, according to an email Klein later released to the media. Adelson pressed Trump to appoint the hawkish John Bolton to a high position, The New York Times reported. In March, Trump fired McMaster and replaced him with Bolton. The president and other cabinet officials also clashed with McMaster on policy and style issues. For Scott Pruitt, the former EPA administrator known as an ally of industry, courting Adelson meant developing a keen interest in an unlikely topic: technology that generates clean water from air. An obscure Israeli startup called Watergen makes machines that resemble air conditioners and, with enough electricity, can pull potable water from the air. Adelson doesn’t have a stake in the company, but he is old friends with the Israeli-Georgian billionaire who owns the firm, Mikhael Mirilashvili, according to the head of Watergen’s U.S. operation, Yehuda Kaploun. Adelson first encountered the technology on a trip to Israel, Kaploun said. Dershowitz is also on the company’s board. Just weeks after being confirmed, Pruitt met with Watergen executives at Adelson’s request. Pruitt promptly mobilized dozens of EPA officials to ink a research deal under which the agency would study Watergen’s technology. EPA officials immediately began voicing concerns about the request, according to hundreds of previously unreported emails obtained through the Freedom of Information Act. They argued that the then-EPA chief was violating regular procedures. A veteran scientist at the agency warned that the “technology has been around for decades,” adding that the agency should not be “focusing on a single vendor, in this case Watergen.” Officials said that Watergen’s technology was not unique, noting there were as many as 70 different suppliers on the market with products using the same concept. Notes from a meeting said the agency “does not currently have the expertise or staff to evaluate these technologies.” Agency lawyers “seemed scared” about the arrangement, according to an internal text exchange. The EPA didn’t respond to requests for comment. Watergen got its research deal. It’s not known how much money the agency has spent on the project. The technology was shipped to a lab in Cincinnati, and Watergen said the government will produce a report on its study. Pruitt planned to unveil the deal on a trip to Israel, which was also planned with the assistance of Adelson, The Washington Post reported. But amid multiple scandals, the trip never happened. Other parts of the Trump administration have also been friendly to Watergen. Over the summer, Mirilashvili attended the U.S. Embassy in Israel’s Fourth of July party, where he was photographed grinning and sipping water next to one of the company’s machines on display. Kaploun said U.S. Ambassador David Friedman’s staff assisted the company to help highlight its technology. A State Department spokesperson said Watergen was one of many private sponsors of the embassy party and was “subject to rigorous vetting.” The embassy is now considering leasing or buying a Watergen unit as part of a “routine procurement action,” the spokesperson said. Even as the casino business looks promising in Japan, China has been a potential trouble spot for Adelson. Few businesses are as vulnerable to geopolitical winds as Adelson’s. The majority of Sands’ value derives from its properties in Macau. It is the world’s gambling capital, and China’s central government controls it. At times, Sands’ aggressive efforts in China crossed legal lines. On Jan. 19, 2017, the day before Trump took office, the Justice Department announced Sands was paying a nearly $7 million fine to settle a longstanding investigation into whether it violated a U.S. anti-bribery statute in China. The case revealed that Sands paid roughly $60 million to a consultant who “advertised his political connections with [People’s Republic of China] government officials” and that some of the payments “had no discernible legitimate business purpose.” Part of the work involved an effort by Sands to acquire a professional basketball team in the country to promote its casinos. The DOJ said Sands fully cooperated in the investigation and fixed its compliance problems. A year and a half into the Trump administration, Adelson has a bigger problem than the Justice Department investigation: Trump’s trade war against Beijing has put Sands’ business in Macau at risk. Sands’ right to operate expires in a few years. Beijing could throttle the flow of money and people from the mainland to Macau. Sands and the other foreign operators in Macau “now sit on a geopolitical fault line. Their Macau concessions can therefore be on the line,” said a report from the Hong Kong business consultancy Steve Vickers & Associates. It’s not clear if Adelson has had that conversation. According to The Associated Press, Adelson was present for a discussion of China policy at the dinner he attended with Trump at the White House in February 2017. In September, Trump escalated his trade war with China. He raised tariffs on $200 billion Chinese imports. China retaliated with tariffs on $60 billion of U.S. products. Adelson has said privately that if he can be helpful in any way he would volunteer himself to do whatever is asked for either side of the equation — the U.S. or China, according to a person who has spoken to him. Torossian, the public relations executive, calls Adelson “this generation’s Rothschild” for his support of Israel. In early May, the Adelsons gave $30 million to the super PAC that is seeking to keep Republican control of the House for the remainder of Trump’s term. A few days later, Trump announced he was killing the Iran nuclear deal, a target of Adelson’s and the Netanyahu government’s for years. The following day, Adelson met with the president at the White House. Five days later, Adelson was in Israel for another landmark, the opening of the U.S. Embassy in Jerusalem. Trump’s decision to move the U.S. Embassy from Tel Aviv to Jerusalem marked a major shift in U.S. foreign policy, long eschewed by presidents of both parties. Besides dealing a major blow to Palestinian claims on part of the city, which are recognized by most of the world, it was the culmination of a more than 20-year project of the Adelsons. Sheldon and Miriam personally lobbied for the move on Capitol Hill as far back as 1995. Adelson paid for the official delegation of Guatemala, the only other country to move its embassy, to travel to Israel. “Sheldon told me that any country that wants to move its embassy to Jerusalem, he’ll fly them in — the president and everyone — for the opening,” said Orthodox Jewish Chamber of Commerce CEO Duvi Honig, who was in attendance. In April, we published an investigation into Michael Cohen’s past. That episode traced how so many of Cohen’s associates over the years have been convicted of crimes, disbarred or faced other legal troubles.But — at the time of the episode — the president’s former lawyer had himself never been convicted, or even accused of a crime.Well, it’s time for an update.Cohen pleaded guilty Tuesday to eight felony counts, including tax fraud, lying to a bank and campaign finance violations. The same hour he was pleading guilty in a New York courthouse, a federal jury some 200 miles away found another former Trump aide guilty: Paul Manafort, the erstwhile campaign chairman. Also eight counts. Also bank and tax fraud. 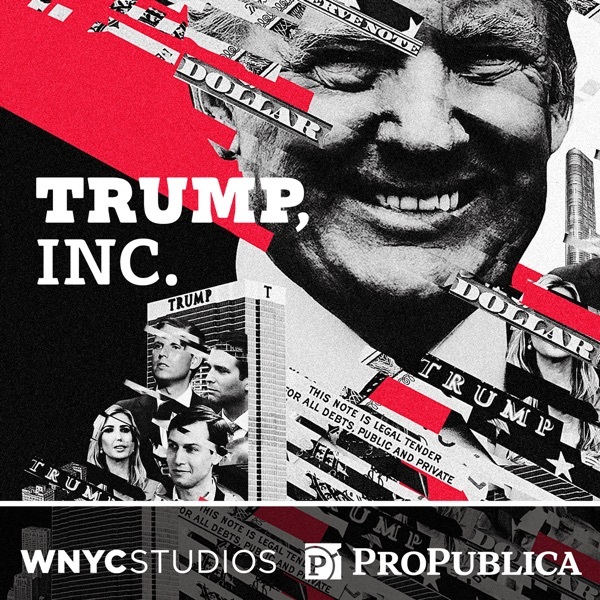 Though the jury couldn’t reach a final verdict on 10 other counts.Trump, Inc. podcast co-hosts Andrea Bernstein and Ilya Marritz sat down with WNYC’s Brian Lehrer for a live radio segment to break down the action. And we’re posting it here for you. Enjoy. And keep an eye on your podcast feeds, because season two of Trump, Inc. is coming your way in September! Sign up to the notified.